My problem is cat allergies; I have always been allergic to cats from what I know. I have several allergies and my allergy medications work for all of them except for cats. I have a boyfriend and he has a cat and I suffer with my itchy watery eyes and other symptoms every time I am at his place. What can I do to feel better when I am over there? Your allergy to cats is shared with about six to 10 million people in the USA alone. Most of the time the source of the allergy is misunderstood. 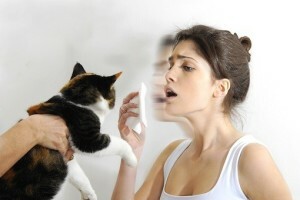 Some people believe they have an allergy because of the cat’s fur or the cat’s dander, which are the scales of the skin. Though possible there are other sources for cat allergies as well. The source of cat allergies primary comes from the albumin found in urine, saliva and blood. There is also an allergen emanating from the cat’s saliva and sweat, which is due to a protein carbohydrate structure called Fel d 1 allergen. The Fel d 1 allergen is smaller than pollen or mold spores. To combat this allergen you might try Flonase or Zyrtec if you haven’t tried them already. However, what usually happens is that this allergen swiftly bypasses the nasal passageway and goes directly to the lungs. When it gets to the lungs it can cause asthma, which might be a reason why you are not getting the benefit from regular allergy medication. Generally speaking the medication is same for all allergies from oral antihistamines, corticosteroids, bronchodilators, and nasal steroids. Since you are having trouble with finding the right medication you will need to talk to your doctor about it. 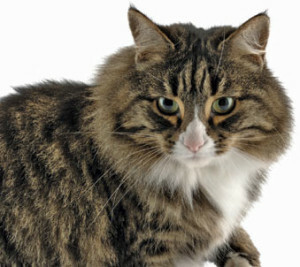 Since this allergen comes to the surface when the cat licks his fur, it can rest on the fur or because it is an airborne allergen it can remain in the air or attach itself to walls or ceilings and float everywhere. What is amazing this allergen can be present years after the cats have been removed from the house. The first thing that is required is that your boyfriend thoroughly cleans his house to get rid of the allergen. Since this allergen is a protein it can be broken down, this process is called denaturing. There are acids or alkaline compounds, which can de nature the allergen. The best way combat an allergy is to avoid it or get rid of it. Your boyfriend can purchase a product called ADMS spray and he can spray everything with it. ADMS spray is not only for cat dander it works on other allergens such as dust mites, pollen, and mold. and mildew. This product is an inorganic anti-allergen with an oxidizing compound, which destroys the allergens. It does not stain and it can be used on everything even bedding. Your boyfriend might also consider investing in a HEPA filter air filtering system and a HEPA vacuum cleaner. He must thoroughly wash the carpets or better still get rid of them because carpets are a common allergen source.In terms of the cat if it is a male the cat needs to be neutered, this will cut down on the spraying and spreading of the allergen through its urine. Though it seems unnatural the cat will need to be bathed a couple of times a week, or at least wipe the cat with a wet clothe daily. Though easier said than done your boyfriend may have to limit the access the cat has to the house, especially in the bedroom or carpeted areas if he is an indoor cat. If he is an outdoor cat let stay outside; weather permitting. Your boyfriend can also use a product on the cat’s coat called Allerpet C, that will not only destroy the allergen but will make the cat’s fur nice and shiny. Another thing to consider is that the cat may not be the problem in the first place. Perhaps you are allergic to dust mites, which every house will have. It is good to get the skin prick test or if your skin is very sensitive the RAST (radioallergosorbent test). This test will identify if poor kitty is really the blame for making you feel so uncomfortable when you are at your boyfriend’s house. After all, your boyfriend loves his kitty too and certainly wants both of you in his life.